A biking enthusiast uses his experience on the road as a springboard for learning the lessons of life and business. Trey Hall built his career as a marketing professional, but it is his lifelong devotion to bike riding that has, in large part, shaped his persona. 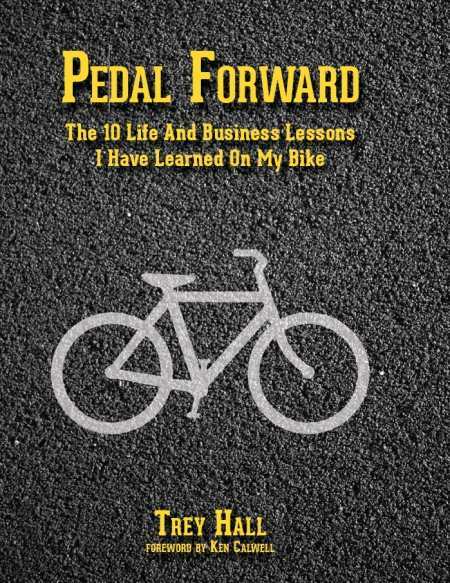 His book, Pedal Forward, is interesting and different for two reasons. First, it recounts the story of how Hall survived a horrific bicycle accident that very nearly cost him and his friend Ken Calwell their lives. Second, the book demonstrates that riding a bike is a very effective metaphor for facing the challenges of life and business. Hall begins, as he must, by talking about the serious injuries he sustained when he and Calwell were riding their bikes and were both struck by a car traveling over fifty miles per hour. The fact that they survived was in itself miraculous but, as Hall writes, it is not the accident that causes you to fall off your bike that is significant: “What matters most is what you do after you fall off. What matters is how you respond to that adversity, how you make yourself better after.” That observation becomes Hall’s first life lesson and sets the tone for the remaining ten lessons in the book. In each chapter, Hall interweaves his experiences riding a bike with occurrences in his personal and business life, drawing a tight relationship between biking and living. In Lesson 3, for example, Hall recognizes that “my greatest discoveries have been made when I pushed on even when instinct said, Stop! Get off the bike! I have learned that we should never be content with easy.” In Lesson 5, Hall acknowledges that “a short ride is better than no ride,” suggesting this translates into “the strength of your character is based on action, not inaction.” While introspective observations such as these are indicative of Hall’s own character development, they also offer valuable guidance to any reader. In terms of content, Pedal Forward may not seem unique, since it reprises many motivational messages one is likely to find in a book about life and business. But it is hard not to get caught up in Hall’s passion for bike riding and for living a good and moral life. Hall’s metaphorical ride makes this a notable book.